Bob Dylan is getting his label baked in the same building where some of his cronies launched the 20th Century’s most noble musical conquest: The British Invasion. 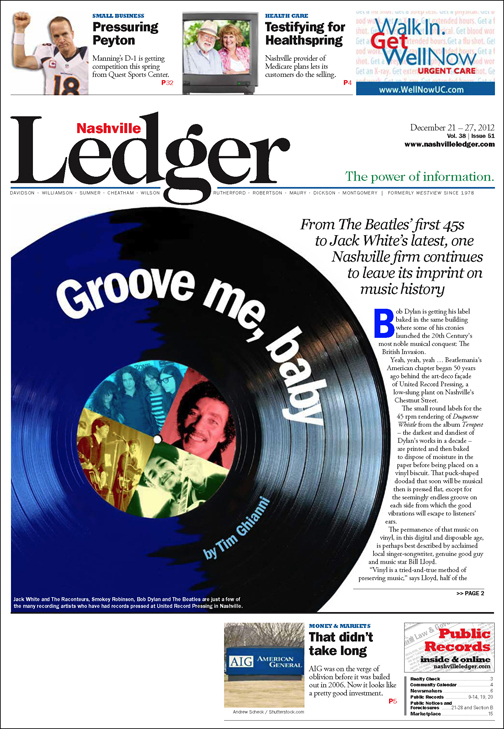 Yeah, yeah, yeah … Beatlemania’s American chapter began 50 years ago behind the art-deco façade of United Record Pressing, a low-slung plant on Nashville’s Chestnut Street. The small round labels for the 45 rpm rendering of Duquesne Whistle from the album Tempest – the darkest and dandiest of Dylan’s works in a decade – are printed and then baked to dispose of moisture in the paper before being placed on a vinyl biscuit. That puck-shaped doodad that soon will be musical then is pressed flat, except for the seemingly endless groove on each side from which the good vibrations will escape to listeners’ ears. The permanence of that music on vinyl, in this digital and disposable age, is perhaps best described by acclaimed local singer-songwriter, genuine good guy and music star Bill Lloyd. “Vinyl is a tried-and-true method of preserving music,” says Lloyd, half of the country genre-busting duo Foster and Lloyd whose other ventures range from playing with Cheap Trick to this year releasing a McCartneyesque, one-man-band explosion of power pop, The Boy King of Tokyo. “Break a branch off a tree and rotate the record and you can still hear the music,” says Lloyd, who is among the fanciers of United Record Pressing. “It’s almost like a living museum,” Lloyd says. He’s not just talking about the music that’s captured on those black and sometimes-multicolored discs, but also on the vibe inside the business, something he and Radney Foster used to rootsy effect in their video for It’s Already Tomorrow, the title track to last year’s superb F&L reunion album. Lloyd, who has been known to huddle late into the night swapping vinyl music with E Street Band bassist and much-welcome recent Nashville repatriate Garry Tallent, is most impressed by what he sees on the production floor of the plant. It is the exact process that was used a half-century ago when the building, the company, the same presses and techniques were being used for The Beatles’ first foray onto the record racks and nickel-a-play malt shop juke boxes across America. Please Please Me backed by Ask Me Why – recorded in November 1962 at Abbey Road in England – became VJ498, the Vee-Jay single that gave Brylcremed and beehived young Americans their first 45-rpm taste of the Fab Four when released in the U.S. the following February. The no-frills upstairs apartment, which has played host to several giants of the music industry, is kept in its mid-century decor. In business since 1949, Southern Plastics – shortly after to become United Record Pressing – was among the locations for the actual manufacture of The Beatles’ discs in the period before Capitol/EMI snagged manager Brian Epstein’s dandy little combo from England’s north county and packaged it for mass distribution. The fact that no one really knew what they had or who these boys were during those early pressings is obvious in the fact that, according to Bruce Spizer’s book The Beatles Records on Vee-Jay, the name of this group that would change the world – mostly for the better – was misspelled as “The Beattles” by the record company. That’s the way it appeared on the first labels printed, baked and surgically implanted on the puck-like vinyl biscuits that are pressed into music on Chestnut Street. The Beatles went on to release many singles on Vee-Jay, and even an album. No one’s sure if any of those were pressed in this maze of buildings and machinery. “There may have been others, but the only one we know of for sure is the first one,” says Jay Millar, director of marketing for United Record Pressing and the man whose tours of the plant are packed with as much history as he can chase down and ladle up. For it’s not just the record pressing that is on display here. The party room on the second floor – once a place for musicians and producers to unwind and also a place where record release parties were held for the likes of the Cowsills, Wayne Newton, Smokey Robinson and the Supremes – is a museum of music and retro furnishings from the era when vinyl was king. A signing party also was held in this space for a 16-year-old Hank Williams Jr., years before a tumble down Ajax Mountain nearly claimed his life and transformed his career. It also is the host site for the little-known but excellent, direct-to-analogue Upstairs at United recording series. Brendan Benson, the North Mississippi All-Stars, Cory Chisel, Smoke Fairies, Jeff the Brotherhood and Keane have plopped down on the Naugahyde furnishings and feasted on the museum-pristine retro warmth while tape rolled. Jack White also performed here on a video he made with Wanda Jackson for Bob Dylan’s Thunder on the Mountain. And, speaking of White, a representative of the transplanted Detroit rock wizard’s Third Man Records, young rock punk Ben Blackwell and his band The Dirt Bombs, decided to take the plant’s tour a few years ago. He didn’t realize it at the time that he’d go on to become one of the steadiest customers, helping White push 875,000 pieces of vinyl through the plant in the last 3½ years. “Almost all of those records say ‘Pressed by United Record Pressing in Nashville, Tennessee,’” Blackwell says. “That’s a connection with them that we are happy with, proud of, excited by. And it’s good advertising for them. 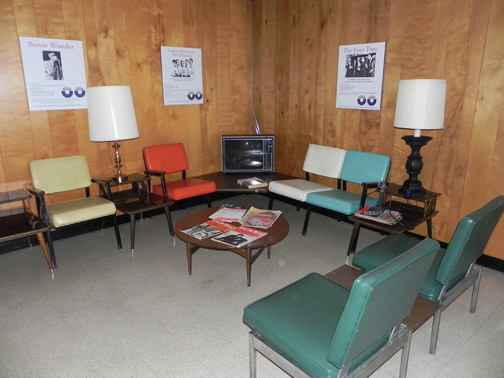 Though it might look like a doctor’s waiting room from the 60s, the second-floor party room has been the setting for events honoring stars from Motown to country to pop. Most of those records that have been pressed by United are for Blackwell ‘s boss, rock star White, who brought his Third Man Records – which focuses on vinyl but which sells CDs by the trailers full – to Nashville in 2009. “I’m the Psychedelic Stooge,” Blackwell says, when asked for his title. When it’s suggested “Psychedelic Cheese” would be a better title for the 30-year-old who is in charge of manufacturing and distribution for one of the world’s great rock guitarists, he agrees. Besides, he’s told, it could be the name of a band. After all, his boss, White, has been known to come up with a good band name or two. While Third Man does release 7-inch discs and LPs by artists like The Shins, Kills and Seasick Steve, most of the records Blackwell carts over to URP for pressing are by his boss’ outfits. “Mainly it’s White Stripes, Raconteurs, Dead Weather and Jack White,” says Blackwell, noting the configurations in which his boss has played and recorded. On this day, for example, URP is busy pressing vinyl LPs of White’s newest effort. “Jack’s album, Blunderbuss, has done about 25,000 (vinyl) copies. At this moment, right now, it’s the highest selling LP in the United States this year,” Blackwell says. And while the product coming out of URP is sought by vinyl raconteurs and Jack While collectors, Blackwell notes that even of that top-selling album Blunderbuss, vinyl sales account for 6 percent of total sales. Blackwell is aware of the history of the plant, and not just because of his own shared roots in Detroit with earlier URP customers like Motown boss Berry Gordy, who occupied an upstairs apartment so he could stay there in relative peace while doing business during the days of segregation. 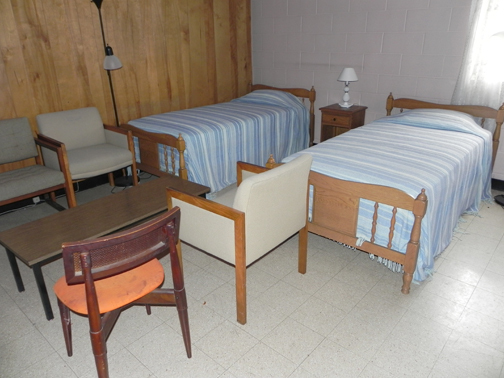 That apartment – beds, appliances, furniture – has been kept in perfect I Love Lucy-era condition, and it is shown off on the tours as well as used as a URP meeting room. While the retro feel is fetching, it’s the relative “now” of the plant’s product that most impresses Blackwell. Fact is his own view of history here goes back to 1998 and his boss’ breakthrough outfit. 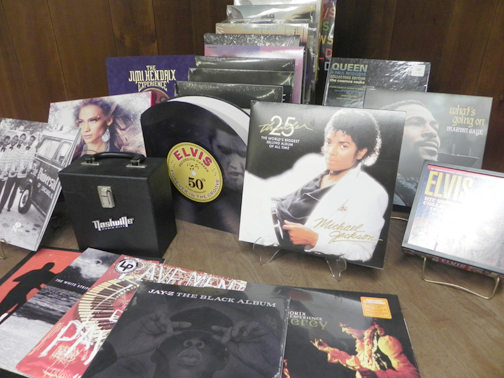 A sampling of some of the albums pressed at the Nashville facility. “The first White Stripes single was pressed at United,” he says. “When it came time to reissue that record, I was able to go to United to see if there is anything left over from it. We reissued it in 2010, but it was originally released in April 1998. And he was pleased when the company went through its archives. “They still do have the original metal mothers, so I’m able to press that record from the original metal parts. I don’t have to remaster it. “When I can do that, the records are structurally the same records that you would have bought 15 years ago at the merch table at a show,” a treasure for purists and collectors. While he somewhat disavows the Planet Mars era during which John, Paul, George and Ringo were pressed, just across Chestnut from the CSX rail yard sprawl, he does relish the Fab-era works of the plant itself. “The last vinyl press was made in 1980,” he says. “There are no new vinyl presses being made right now as demand is being increased. While record pressing plants may come and go, depending on their own business strategies and the demand for vinyl, someone else purchases the actual equipment, Blackwell says. “The presses are just shuffling from one place to another, so the capacity stays the same. Maybe someone finds an old press that’s been mothballed since the 1960s,” Blackwell explains. Bringing that machine up to par would be the main thing needed to add to the production of vinyl. “In any other business, whether it’s building cars or manufacturing solar panels, that is what happens. It’s not the machines you want, it’s the machines that make the machines” that keep the business alive. So while Blackwell mainly uses as reference points the historic importance of the pressings of White Stripes and others from the 1990s vinyl underground, there isn’t much point in denying that The Beatles records were pressed on the same machines that fashioned not only Jack’s works but also stuff by Dan Sartain, Dex Romweber Duo and Mildred and the Mice. As noted, on this cool autumn day, The Beatles’ contemporary and acclaimed multi-faced and multi-faceted dark poet Dylan, has his 45 working its way through the process. After the baking is done, Dylan’s Duquesne Whistle labels – the 45’s flip side is an alternate version of his Meet Me in the Morning, first spun to greatness on 1975’s Blood on the Tracks LP – will be automatically placed on a press with a vinyl biscuit of the same diameter. Moments later, a grooved copy of the disc will spit out. The edge is trimmed, and the disc is sent down the line for packaging and distribution. It’s the same process United Record Pressing has been using for more than six decades from this unobtrusive building – with its seemingly time-out-of-mind art deco tiles and record mockups on the façade – a long homer’s urban bounce past the left-field walls of Greer Stadium. Now, like drive-ins, calliopes, roller-skating carhops and organ-grinder monkeys, it’s got vintage charm, suitable for the resurgence contained within, as vinyl 45s and LPs have come back into audiophile fashion. It’s fitting that, given his shambling and rambling poetry and carefully crafted hobo hipster image, Dylan’s discs are being turned from puck-like vinyl to smooth-grooved music here. The B side of the Dylan disc, Meet Me in the Morning, is also a suitable choice for this record plant, since the first time he performed the song live was during a 2007 visit to The Ryman Auditorium. Not so ironically, it was White – among the customers who have turned this plant into “the place” for pressing – who climbed onto the stage, strapped on his guitar and accompanied Dylan on that song and others during a two-night stand that had Elvis Costello serving as both opening act and hero-worshiping accompanist. Costello, a trend-buster since before he changed his name from Declan Patrick McManus, has had many vinyl pressings done at United. Albums by Amy Winehouse and Third Day, being pressed into vinyl just around the corner from where Dylan’s label bakes on the day of this visit, illustrate the eclectic variety of what is done here. While The Beatles’ story is case-in-point of just what is so important about this plant, no living staffers who worked at that plant five decades ago could be located for this story. Back then it wasn’t just “The Beattles” pressing that was important here. Just as now it’s not just White and the vinyl underground that use these presses. As the interest in vinyl has grown, mainstream stars like The Rolling Stones and deceased-but-fabulously-prolific compatriots Elvis and Johnny Cash have had singles and LPs pressed here. Taylor Swift and Adele are among the other living superstars who use the facility. Fact is, back in 1962, nobody knew the four-man combo from Liverpool had a destiny any different than the rest of the clientele – Motown groups, pop stars and rhinestone twangers – whose records were pressed in vinyl here. All that mattered is that Vee-Jay sent down masters that were turned into mothers for pressing. Strictly business. Where are those Beatles mothers now? “We think The Beatles record is probably back here someplace,” says Millar as he leads the way through the operation. Here, in a back building, many, many thousands of cardboard files – each a little bit larger than the size of an old LP jacket – are crammed into floor-to-ceiling shelves. Other stashes are jammed in spaces throughout the complex. But he does believe the first volley of the British Invasion is likely contained inside one of those non-indexed, numbered files. If it is ever discovered, there is magic within. Just ask Lloyd, whose knowledge of and passion for The Beatles and their work not only helped him fashion his own jangly career but provides fruit for the occasional and acclaimed gigs by The Long Players, Nashville music scene LP purists who recreate on-stage classic vinyl albums, first groove to last. The Long Players meticulously recreate classic albums of the likes of Springsteen, CSN&Y, Sly and the Family Stone and The Rolling Stones. But there is joyful night-tripping into the works of The Beatles, including Let it Be, Abbey Road and others. And at least one piece of it was manufactured in the same building where Bob Dylan is getting his label baked on Chestnut Street.